For the month of September, we are shining our maker spotlight on local designer Margarette Laizure. We have been carrying Margarette's unique line of clothing for the last three years and it has been a pleasure getting to know this artistic woman. Margarette's pieces are extremely unique, well made, and the fabrics she chooses are heavenly. Read on for more details about her line of wearables and how she came to be a full time designer. How long have you been sewing? I have been sewing since I was 12 or 13. There may have been even earlier adventures with a needle and thread. How long have you had your business and tell us the history of how you got started to where you are now. I've been in business for about 4 1/2 years. It actually began in fits and starts when I woke up one day and decided I'd like to be a costume designer. So I sketched and made a portfolio and found volunteer work with local theaters. I worked with the head costumer and soon found myself designing costumes for all the players in theater productions for pay. This was at the same time I was going to fashion design school, where I met a kindred spirit. I moved away, but we kept in touch and after school she opened a store in San Francisco. When I returned to the bay area, I became one of the designers in her store. It was also around this time when I met Kate, who was starting Resurrect. Both of these stores nurtured and supported my arts and crafts approach to fashion design. It's been interesting to see the similarities and differences in what people react to on both sides of the bay. I have now expanded to six stores and still design and produce everything myself. Tell us about your brand and what is involved in a Margarette Laizure garment? I decided to go with my own name for my brand and use the tag line "Free and Feminine". It comes out of my own free-spirited lifestyle and the belief that femininity is a powerful and good force in the world. I start with a sketch and either drape the piece or make a pattern on paper. I try to use the finest fabrics I can find. I choose them based on ease of care, but consider that they should last from season to season. I am not into current fads and trends--I never have been--but I admit they are fun and sometimes influence my designs and fabric choices. After all, girls just wanna have fun! What inspires your creative process? When I let go of my ego and approach my work in a relaxed state. What is your favorite piece you have ever made? The Pices dress, which evolved into the Dansk dress. It has a flattering sculptural quality, and is very modern. 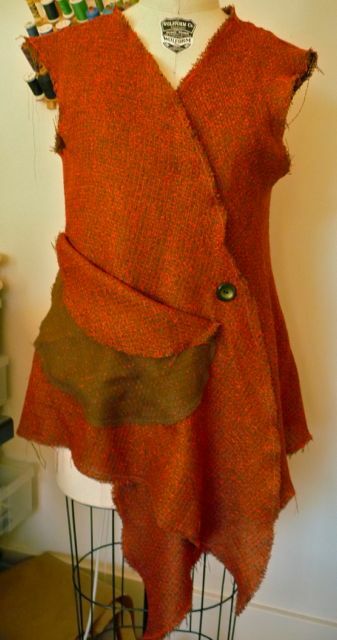 I also like one of the first pieces I created called the Autumn Vest (pictured below). For this vest, I used the selvage in the design and kept it very raw. Someone told me Chanel uses the selvage! What advice would you give someone just starting out as a designer? Remember that organization is very important. What do you do for fun and what are your favorite Bay Area or California spots to hang out? I love to swim. The Monterey/Carmel areas are very special to me. Tahoe and Yosemite are also quite awesome. My husband and I like to go see live music and we often go to our favorite Indian place called Ajanta on Solano. I also like to hang out at the De Young Museum and dream of putting a collection in there someday. I also enjoy going to see up-and-coming artists at local galleries- Very inspiring! Margarette is always available for custom work, including bridal as well as alterations. She in the process of planning some fall and winter pop-up events, so follow her on Instragram for more info: @margarattelaizure or check out her website.